WHAT ARE THE 9 HERBS? This is my friend Jayne Robinson’s Herb Garden. Isn’t it fab that she can grow so much in the corner of her balcony! I’ve numbered each herb. How many can you guess?! Send me a comment with the numbers and names and I’ll let you know who the first is to guess them all… or at least to guess the most right! 1. Corriander 2. Sage 3. Chives 4. Oregano 5. Rosemary 6. Basil 7. Marjoram 8. Parsley 9. Dill ??? I know some of them might have diffrent name in US. 2. hard to see… oregano, maybe? Don’t know. booo! 7. eee. I swear I’ve cooked with that. Is it marjoram? Nice little contest. Great idea! 1. is wayee back there. I’m going with Parsley but it’s hard to tell. No. I’m going to change it to that herb used a lot in Mexican dished that begins with an “S”. Oh, it sounds like oh,”S” but I think the way to spell it’s with a “C” Cilantro ??? 2. Also hard to see. Perhaps it’s a sage. 3. I’m going with droopy chives. 4. Kinda looks like some type of enlarged eyebright but??? maybe oregano. 5.Rosemary. 6. Basil. 7. Thyme 8. Parsley, but if that’s parsley, number 1 shouldn’t be . . . 9. Dill. Oh my, I love the clever idea and the photograph, but the only one I can identify is #5 rosemary. Maybe. I think I recognize it because a friend gave me a rosemary plant once and my loving care killed it. So now if I want fresh herbs, I depend on the kindness of friends and relatives who can grow them and sometimes share with me. I’ll be interested in the correct responses. 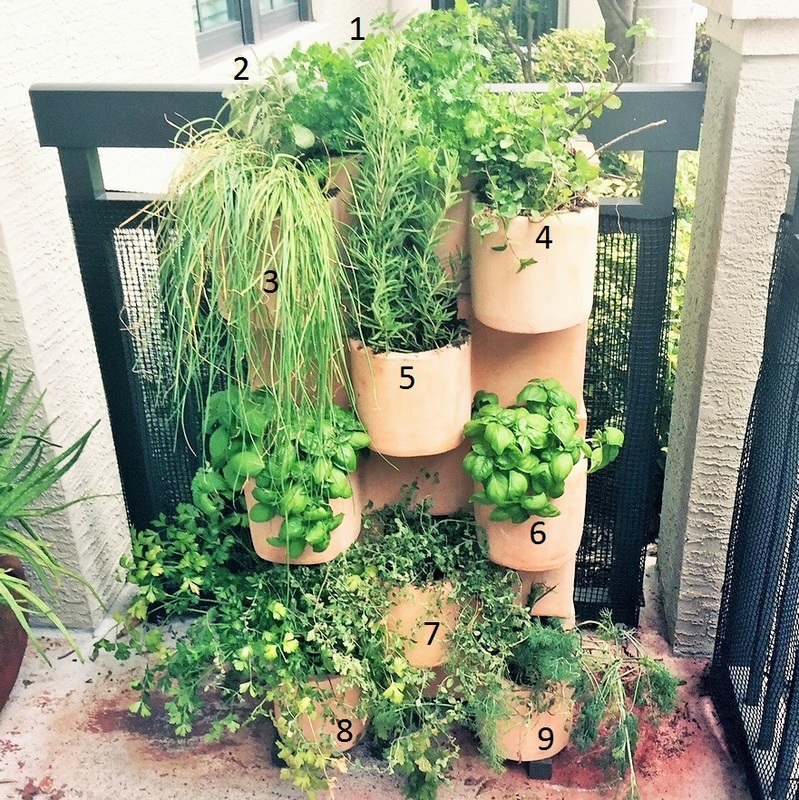 1-parsley, 2-sage, 3-lemongrass, 4-thyme, 5-rosemary, 6-basil, 7-oregano, 8-cilantro, 9-dill. I often get flat leaf parsley and cilantro mixed up. I usually have to taste them. I am not certain about chives, oregano and thyme. thyme usually has white edges to the leaves, but the plant looks like thyme. Can’t wait to see how many I got! What a lovely herb planter – as I have a balcony I would be interested to know where she bought that? Very cool design and makes looking after herbs in a small space makes it very manageable indeed. I used to have a garden and a wooden planter and I know from experience how herbs can wuickly take over a garden if they are not contained somehow. Mint is one of the worse culprits and will pop in different parts of the garden and before you know it – take over. I can at least tie for the loser! Don’t recognize any. I sometimes can recognize a herb by the smell but pictures, no way. Have fun with the rest of your readers. I’ll be watching for results.